Uglyworld #292 - We Bought You A Birthday Cake, originally uploaded by www.bazpics.com. 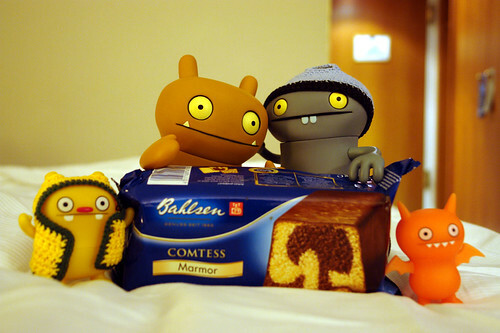 I was shocked and surprised when Wage, Babo, Jeero and Orange Ice-Bat woke me up tonight (I had only been asleep for 15mins or so) singing happy birthday (was really funny and Ice-Bat managed to really hit the high notes). They picked up a Marmor cake for me (they called Mireille to find out which one to buy) to keep me going until I get home on Friday.